Warning signs in today’s The Australian make me reconsider my political allegiances. Paul Kelly writes that Rudd is now going for Emperor, not for King, as I’ve been reporting in my secret blog for quite some time now. I show Kevvie the article and only elicit a wink, a smile and a touch of his nose. “First things first, Christevan,” he says. Rudd eventually being crowned Emperor of course puts a whole different complexion on things. Seeing off The Green-Islamist Alliance, the Progressives, the Unions and most of the faceless men is all part of a much bigger goal of accommodating that enormous ego of his. Coalition leader Tony Abbott must really be quaking in his boots now. The wicked witch has been ousted and a vacuous cardboard cut-out has returned and the people are now, in droves, reconsidering the wisdom of voting for the Coalition. Oh woe of woes, it is painfully obvious now that Abbott was never a popular choice when the toxic Gillard was in power: only the last resort. It would be bad enough – no, a catastrophe if after all Labor’s problems people now returned to the Labor camp and decided to vote for Rudd instead of Abbott. But now, after reading Paul Kelly’s article in The Australian today, the nightmare of nightmares, the mother of all humiliations and despair stares Abbott in the face. 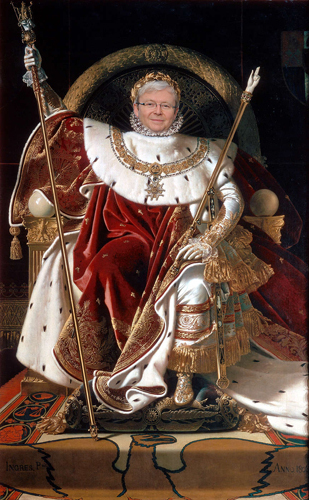 The possibility of Rudd being crowned with a laurel wreath as the Grande empereur de l’Australie, all-powerfully wrapped in ermine, holding a golden sceptre in his hand and forcing Tony to wear only his budgie-smugglers at the coronation is just too painful to think about. Even for all of us. This entry was posted in Budgie-smugglers, Rudd Re-election, The Greens, Tony Abbott and tagged Napoleon. Bookmark the permalink.